I recently posted a graph on supply versus demand balances. This has drawn significant interest, as it stands in stark contrast to the forecasts of all the agencies, OPEC, and the major forecasting firms. In this post, I will discuss the underpinnings. The major agencies, the US Energy Information Administration (EIA) and the European International Energy Agency (IEA), as well as OPEC, expect demand to increase moderately in 2015, up 1.0 to 1.6 mbpd (million barrels per day), with an average gain of 1.2 mbpd. This represents a middling year, better than 2014, but certainly unexceptional in recent times. Given that oil prices have fallen by more than half, the agencies must consider price elasticity of demand to be something close to zero. According to these views, cheap oil does not make people buy more of it. This was not so the last time we saw a comparable price collapse, back in 1986. By that time, OECD oil consumption had been falling for years and the global economy was slowly recovering from two sequential recessions and a period of stagnation--a situation very similar to today. Oil prices fell in February 1986, and the response was nearly instantaneous. Although Q1 1986 consumption growth was only 0.1% (quarter over same quarter previous year), the next quarter oil consumption soared, up 5%, and would remain at this elevated level for the balance of the year. In the more recent episode, oil prices began to plunge in Nov. 2014, that is, one calendar quarter earlier than during the 1986 experience. In 1986, a major response required hardly more than a single quarter. Were that to hold in this case, by mid-year, we would expect to see a surge in demand. Of course, it is not 1986. The populations of OECD countries are older and more mature in their driving habits. On the other hand, efficiency gains have not been as impressive this time around, and fast-growing China, India and the rest of the non-OECD are major players in oil demand, which they were not at the time. I have not made any adjustments up or down to account for these factors, but rather left the graph as an updated version of 1986 to allow the reader a sense of how demand would respond if the patterns of that earlier period were to be repeated. If a comparable resurgence is to be expected, history suggests that we will see it by summer, or not at all. Despite low oil prices, all the major agencies see the oil supply up in 2015. The first two quarters of 2015 are expected especially strong, up by an average of 2.0 and 1.7 mbpd respectively, for Q1 and Q2. I have essentially adopted the IEA's view of these two quarters. 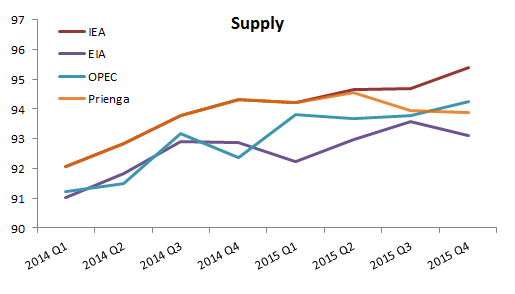 By the end of 2015 (Q4 ' 15 on Q4 '14), the agencies see supply up 1.1 mpbd, with a wide variance of expectations. OPEC sees supply for Q4 up 1.9 mbpd year on year, whereas the US EIA sees supply up a mere 0.2 mbpd. In our own approach to supply, based on the Lessons of '86, we tend to think of oil production in four categories: OPEC, shales, capex intensive projects, and non-OPEC conventional, onshore production. Start with OPEC. The cartel has stated its intention explicitly: no production cuts, plus whatever production increase Iraq can muster. Therefore, the Prienga scenario sees OPEC output unchanged, except for an increase of 320 kbpd to Iraq's production by year end. Shales have been much discussed in the analyst community, and they are critical in any supply forecast. In recent weeks (days), analysts seem to be gravitating toward the view that US shales will peak into the middle of the year and decline thereafter. We also ascribe to this view. Large capital projects have their own momentum, and I would not expect these to be altered greatly in 2015 (although 2016 may see a down trend). For example, any deepwater platform slated to come online in 2015 will likely do so, regardless of oil prices. By contrast, conventional onshore production is highly sensitive to oil price changes. During 1986, US conventional production fell by 800 kpbd in the ten months from March to December. We have every reason to expect a replay of such an outcome this time. High oil prices affected more than just unconventionals; they support conventional production as well. Traditionally, high oil prices do not increase conventional production, but they do prevent it from falling with the decline curve. When this support is withdrawn, conventional production quickly returns to the long term decline curve. US conventional onshore production is currently 1 mbpd above the curve. We might expect such production to decline by anywhere from 500 kbpd to 1 mbpd by year end at current prices. Of course, the US is not the only country in this boat. Chinese oil field services activities are also collapsing, as is activity in countries as diverse as Colombia, Indonesia and Malaysia. At the high end, 8 mbpd of non-OPEC production could be subject to the same pressures as US conventional production. Therefore, based on the 1986 experience, we have adjusted supply down by 1.5 mbpd by Q4 2015 compared to the IEA's expectations. This is roughly comparable to a fall of 700 kbpd from US onshore conventional production, and a similar drop from conventional production in other non-OPEC countries. In the view of the agencies, supply runs ahead of demand for the balance of the year. On the other hand, if we apply the Lessons of '86, this surplus evaporates around mid-year, setting the stage for major reversal of outlook heading into 2016. Were this scenario to be realized, the world would be heading into an oil shock in the first half of next year. Any excess of supply over demand ends up in inventories. In the graph above, we have made an estimate of excess oil (petroleum liquids) inventories based on the individual agency forecasts. This is not total inventories, but only the excess stocks beyond ordinary levels. The IEA and OPEC see massive builds of excess inventory to the middle of the year. By mid-year, excess stocks approach 500 million barrels, enough to fill more than 200 VLCCs, very large crude carriers. The EIA sees a lower level forming, about 300 mb. These balances do not ease into the second half of the year. Given that 500 mb is 16 months of excess inventory (drawn at the hefty pace of 1 mbpd), one has to wonder how these barrels find their way back to the market. It is hard to see how prices in late 2015 would, in either the OPEC or IEA scenario, stand at sufficiently high a level to induce production growth, that is, prices might very well remain below marginal cost in these scenarios through year-end 2015. Indeed, one could envision a scenario in which prices are driven down to shut-in levels. Should the market decide that 500 mb of excess inventory is simply not an appealing prospect, prices could fall to levels requiring producers to keep crude in the ground, that is, potentially as low as $25 / barrel. On the other hand, the Prienga scenario envisions both a strong supply and demand response to low oil prices. This is consistent with the historical record, which may or may not prove applicable to the current situation. If it does, the effects will be visible by mid-year. In such an event, a deficit appears and excess inventory is consumed in short order. By the last quarter of the year, prices have recovered to a level sufficient to bring forth incremental supply. OPEC's attitude depends heavily on the scenario chosen. If OPEC believes its own, or the IEA's, forecast, then cutting production makes little sense, particularly for Saudi Arabia, who will be asked to take the brunt of any adjustment. While such a cut would surely raise prices and net revenues to the Kingdom, a pre-mature return to higher prices could re-start the shale business even before it winds down. In such an event, the Kingdom is offered no obvious window into which to re-inject volumes earlier withdrawn. Any temporary cut could prove permanent, something which the Kingdom is keen to avoid. On the other hand, the Prienga scenario threatens just the opposite risk: Saudi Arabia waits too long to raise prices, allowing too much demand to develop and too much production to fall off. If one believes--as we have consistently argued--that we are only now exiting two sequential oil shocks, and if one accepts Exxon's view that the conventional supply has peaked out, then a laissez-faire attitude from OPEC could spell disaster a year out. Other than shales, the oil supply is not healthy. A collapse of oil price did not make finding and delivering other kinds of oil much cheaper or easier (although it has reduced the cost of services to an extent). The current price of oil is putting enormous stress on a mature oil system, and we do not know quite how it will respond. It may react poorly. A delayed response by OPEC could result not only in hundreds of billions in lost revenues to the cartel, but in yet another oil shock for a global economy barely emerging from the last one. Such a move would prove both bad policy and bad politics. With the collapse of oil prices, the world has changed. We live in new regime. The rules of last year may still apply: a collapse of oil prices may fail to rekindle demand for oil or fail to curtail the growth of production. But history suggests a different narrative. History tells us that the oil markets will respond, and respond sharply.